Hike the inland paths between Grasse and Menton overlooking the Mediterranean. Enjoy an endless array of coastal panoramas and pass through a variety of scenic landscapes peppered with picturesque villages, hike by steep gorges and tumbling waterfalls, enjoy the Riviera's mild climate. You begin your journey in Grasse, the capital of fragrances. Depending on your arrival time you may wish to explore Grasse's old town, visit a perfumery or the Cathedral Notre Dame du Puy. This town is a true gem, up in the hills north of Nice with numerous ancient buildings and lots of character. Today's walk to Pont du Loup takes you by the Belvedere of Grasse and the beautiful medieval village of Bar sur Loup. Don't miss the St Jaques-le-Majeur church with its impressive altarpiece and the 'Danse Macabre' or 'Dance of the Dead', a painting dating from the 15th century. Bar sur Loup is perched on a rocky spur overlooking the Loup River valley and is the perfect location for lunch before walking down to the bottom of the valley, at the mouth of the Gorges du Loup. Pont du Loup is small but charming. The tall pillars of an old railway viaduct cross the valley here, towering above the buildings of the village. Today's 16km walk is expected to take about 6 hours and you will ascend 750m and descend 600m. Today you will ascend on the so-called 'Paradise Path' up to the medieval village of Gourdon, at an altitude of 760 metres above the Mediterranean Sea. Along with its must-see 13th century castle, you can enjoy beautiful views overlooking Cannes and its surrounds. The path from here is breathtakingly carved into the cliff-face of Gorges du Loup and you pass through tunnels and over footbridges and an aqueduct to the village of Courmes, located right above a waterfall. Today's 14km walk is expected to take about 6 hours and you will ascend 795m and descend 350m. Following a scenic ascent from the Pic des Courmettes (1248m), you will find yourself looking out over a stunning view all the way from Nice to Mandelieu. You can see the Gorges du Loup, city of Cannes, and the Lerins islands, whilst in the background lie the mountains of the Alps and the Mercantour. From the edge of the Puy de Tourette, you will look out over to the limestone plateau of Caussols towards Vence, Cheiron and various villages. All along the descent towards Vence, you can admire the beautiful landscapes of the Mediterranean with its 'restanques' (terraces dating back to the 16th century). Your destination of Vence is a wonderfully quaint town with a beautiful 11th century cathedral. Today's 16km walk is expected to take about 4.5 hours and you will ascend 350m and descend 650m. Today starts with a short a short taxi transfer to Coste Berarde. From here you cross the limestone plateau of the Plan de Noves to Saint-Jeannet, an extremely picturesque and authentic Provencal village perched on a ledge beneath the towering Baou de St Jeannet. You can hike up to the summit of the Baou (limestone escarpment) for a magnificent view out over the pink and yellow tiles of the village towards Nice, Antibes, the Baie des Anges (Angels Bay) and Estere. This stage is a personal favourite for many. Today's 15km walk is expected to take about 5 hours and you will ascend 600m and descend 750m. After a taxi transfer (40min) to La Turbie, you set off on your hike into the Var Valley. Walking on trails high above the Mediterranean, you'll enjoy superb views over Monaco, Roquebrune Cap Martin and Menton. At the summit of Baudon (1200m) you are less than five kilometres from the sea with a panoramic coastal view stretching all the way from Ventimiglia in Italy to St Tropez. The route continues, ascending through the old village of Gorbio to Saint- Agnes. Perched on a rocky outcrop at an altitude of 766 metres, you can stroll along the quaint cobbled streets of the village or visit the ruins of a 12th century castle that once protected the village from Saracen invaders. Today's 12km walk is expected to take about 4.5 hours and you will ascend 770m and descend 580m. From Saint Agnes it's a long and scenic descent to Menton and the Mediterranean Sea. With the sea in front of you, this section of the route, passing through a variety of vegetation zones, is a real delight. Finally you arrive on the Riviera itself in the charming resort of Menton with its old town and its beach: tradition says that you must have a swim in the refreshing water! Today's 10km walk is expected to take about 3.5 hours and you will ascend 250m and descend 900m. Bring a water bottle (preferably 2 litres) and high factor sun cream. Trekking poles are recommended. Tap water is safe to drink as are the fountains found in villages, but water sources along the trail may not always be drinkable. Using tap or purified water rather than bottled water will help avoid creating plastic bottle waste. Energy snacks including chocolate and sweets are recommended whilst on trek. You will need a torch for the tunnels on day 3 - Pont du Loup to Courmes. For this trip you can fly into and back from Nice airport. Nice is served by both budget airlines (EasyJet from Gatwick) and non-budget airlines (including British Airways and Swiss Air). For this trip you can fly into and back from Nice airport. From Menton to Nice airport you can take bus number 110 which takes about 1 hour and costs approximately 25 Euros. 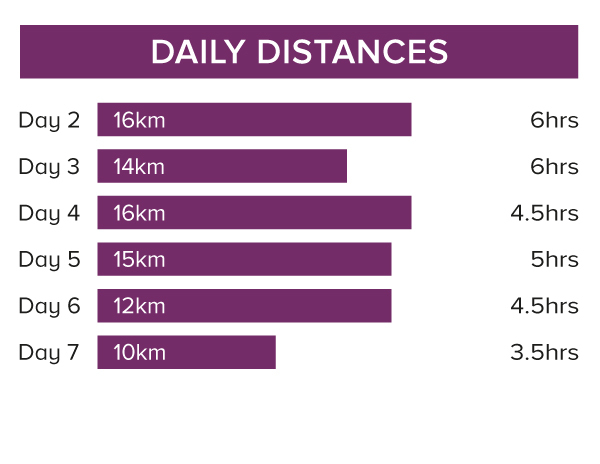 On this tour we walk 83 km over six days (an average of 14 km per day). We generally walk on well-marked paths and dirt tracks, there are some road sections. We have graded the route as moderate. Walking Programme Manager Caroline Phillips and Self-Guided Product Manager Ali Butler set out for the Riviera on a recce from a stormy Farnborough for three days of walking. Find out how they got on and what were their surprises and highlights. Mon 22 Apr 2019 - Sat 27 Apr 2019 Your trip can depart anytime between the above dates. Contact us for triple room requests and solo traveller prices. Mon 29 Apr 2019 - Sat 4 May 2019 Your trip can depart anytime between the above dates. Contact us for triple room requests and solo traveller prices. Mon 6 May 2019 - Sat 11 May 2019 Your trip can depart anytime between the above dates. Contact us for triple room requests and solo traveller prices. Mon 13 May 2019 - Sat 18 May 2019 Your trip can depart anytime between the above dates. Contact us for triple room requests and solo traveller prices. Mon 20 May 2019 - Thu 23 May 2019 Your trip can depart anytime between the above dates. Contact us for triple room requests and solo traveller prices. Tue 28 May 2019 - Sat 1 Jun 2019 Your trip can depart anytime between the above dates. Contact us for triple room requests and solo traveller prices. Mon 3 Jun 2019 - Sat 8 Jun 2019 Your trip can depart anytime between the above dates. Contact us for triple room requests and solo traveller prices. Mon 10 Jun 2019 - Sat 15 Jun 2019 Your trip can depart anytime between the above dates. Contact us for triple room requests and solo traveller prices. Mon 16 Sep 2019 - Sat 21 Sep 2019 Your trip can depart anytime between the above dates. Contact us for triple room requests and solo traveller prices. Mon 23 Sep 2019 - Sat 28 Sep 2019 Your trip can depart anytime between the above dates. Contact us for triple room requests and solo traveller prices. Mon 30 Sep 2019 - Sat 5 Oct 2019 Your trip can depart anytime between the above dates. Contact us for triple room requests and solo traveller prices. Mon 7 Oct 2019 - Sat 12 Oct 2019 Your trip can depart anytime between the above dates. Contact us for triple room requests and solo traveller prices. Mon 14 Oct 2019 - Sat 19 Oct 2019 Your trip can depart anytime between the above dates. Contact us for triple room requests and solo traveller prices. Mon 21 Oct 2019 - Sat 26 Oct 2019 Your trip can depart anytime between the above dates. Contact us for triple room requests and solo traveller prices. Mon 28 Oct 2019 - Thu 31 Oct 2019 Your trip can depart anytime between the above dates. Contact us for triple room requests and solo traveller prices. Fri 1 Nov 2019 - Sat 2 Nov 2019 Your trip can depart anytime between the above dates. Contact us for triple room requests and solo traveller prices.